Calling all the lovely couples out there, Carolina Herrera is currently offering a 212 NYC lover’s cup set as a gift with purchase! All you simply have to do purchase a selected fragrance from Carolina Herrera’s fragrance line to get your hands on this awesome gift. This offer is only available at The Fragrance Shop so get your hands on it now! Carolina Herrera is a Venezuelan-American fashion designer known for her exceptional personal style. Her style is best described as dramatic and impeccable. How can offering a lovers’ cup set as a promotional gift benefit your company? This set of lovers’ cups is an incredible offer as when customers buy your product they get a promotional gift set instead of a single gift item! This helps to increase the perceived value of the entire promotion! 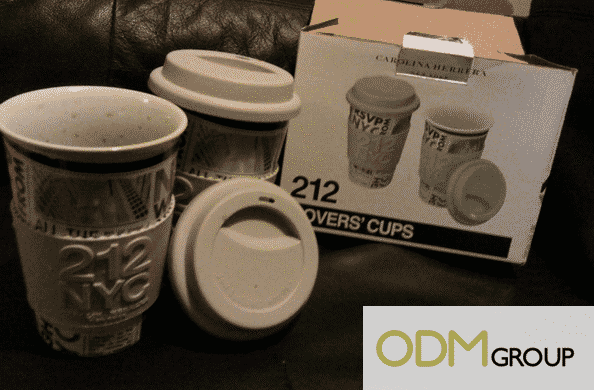 Furthermore, this gift cups set is highly practical and can be used by every single one of your customers! Those who receive it are sure to find great use for the cups. In addition to that, Carolina Herrera has also branded the cup with the 212 NYC logo and design. By branding the cup, this helps to increase brand awareness and visibility. This is excellent for the company as it provides free repeated advertising every single time the cup is used. If you are interested in customizing your very own promotional cup, feel free to contact us at ODM and we will be glad to assist you in getting started! Budweiser’s FA Cup competition – Win tickets to the FA Cup final!